We all know that our own education is important and in this fast-paced world not only is technology constantly changing, but so is our understanding of how to use it and of how we communicate with each other; therefore education is important not just as a child or young person, but as a philosophy to embrace throughout life. But why is educating your customers important from a digital marketing perspective? It builds your credibility, proves your expertise and reassures customers that you know what you’re talking about. It allows customers to make an informed choice, meaning that they’re more likely to make the decision to purchase while on your website. Creative, educational blogs, infographics and related content receive more likes, shares and links than sales orientated content. It’s good for SEO, as Google measure links to a site and time spent on a site and place sites with more links and longer browsing times higher in the results. All the above factors make educating customers a powerful digital marketing strategy that increases profits and improves the bottom line. The infographic below is an example of a lighthearted piece of content marketing we created to educate our customers about what Google might do next. Infographics are a fantastic way to market your company’s product or service by educating customers and can be used both on your website and on a range of high profile infographic sites, image sharing sites and social media platforms. People are more likely to read them! The best infographic sharing sites (those with the highest domain authority) often stipulate this as a requirement, therefore your infographic will appear on better sites and the SEO benefit will be significantly higher. Educational infographics often generate likes and shares and have the potential to go viral. Other people will link to a creative infographic that makes an interesting point or provides some useful facts or ideas, but won’t link to an advert. When we design infographics as part of a digital marketing campaign, our strategy is to include our client’s logo or web address on them at the bottom of the design and submit them with a description that includes a link to our client’s website. This way it achieves all the objectives in the ‘Why educate your customer?’ section and is a powerful SEO and marketing tool. Quotagraphics combine a quote and a visual to create a compelling image that informs or entertains. They are used in much the same way as infographics, described above. 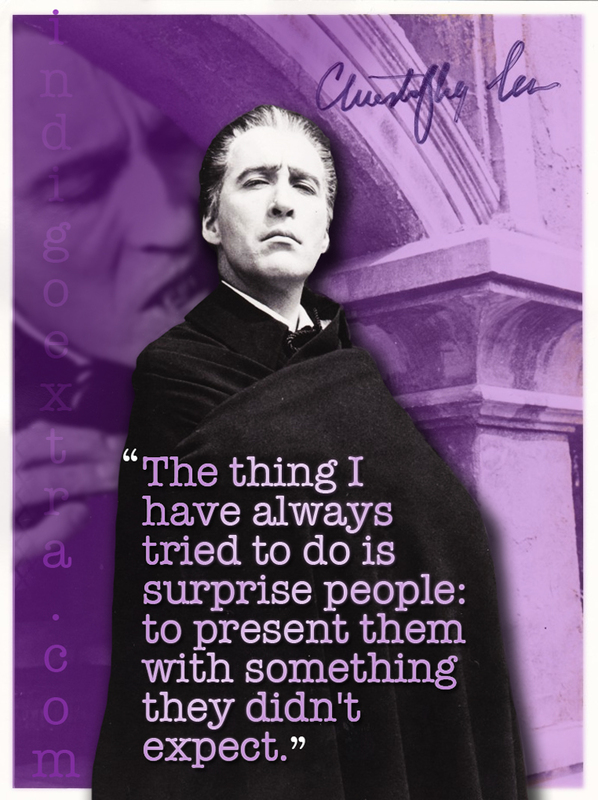 This quote from Christopher Lee is particularly relevant to the creative process! Write content that your customers are interested in. If you already have an established brand, or a group of niche followers, they may want to know more about you, what your next creation is, etc. If you’re a new company odds are that you’ll capture more interest by blogging about market trends, product comparisons, the latest industry news, etc. Keep it on-topic. If your website sells clothes, all the blog articles should be about fashion. If it’s a site about tourism in France, don’t write about Germany in your blog! It’s better to write fewer blogs that are longer and well-written than lots of rushed blogs. If you provide a service, rather than selling products, consider offering a weekly insight into your industry. Include plenty of creative images and layout your blogs so they’re attractive and easy to follow (use sub-headings and bullet points for example, not just one long page). Facebook, Twitter and other social media sites are a way to reach your clients on a human level. If your marketing strategy involves adding constant ‘sale, sale, sale’ messages, then you will quickly put people off, however if you include entertaining or interesting posts, it’s a good way to engage your audience. We recommend keeping your social media posts short and if you’ve written an in-depth article, including this on your own blog and linking to it from your social media profile. This way you drive traffic to your website. There are plenty of blogs, news portals and other websites that are on the look-out for an interesting article or an informative news item and niche article placements can be a powerful part of your digital marketing strategy if done correctly. Be original and unique – only used on a single site. Be placed on relevant websites with a decent domain authority and reputation. Engage visitors and generate spontaneous likes or shares. There are plenty of ways to educate your customers as part of your marketing strategy, you just need to get creative!